Jupiter (after whom the planet was named) was considered to be by the Romans the supreme god of the pantheon of gods that they worshipped. He was supposed to be a majestic and powerful figure that also possess leadership qualities to lead them. He was referred to as the “shining father” due to the fact that the mythological stories all depict him as a god who had a mystical glow around him. He is supposed to be the god of light and sky and the protector of the state. He is a son of Saturn and brother of Neptune and Juno (who is also his wife). The Romans worshipped him especially as Jupiter Optimus Maximus (all-good, all-powerful). This name refers not only to his rulership over the universe but also to his function as the god of the state who distributes laws, controls the realm and makes his will known through oracles. His English name is Jove. He had a temple on the Capitol, together with Juno and Minerva, but he was the most prominent of this Capitoline Triad. His temple was not only the most important sanctuary in Rome; it was also the center of political life. Here official offerings were made, treaties were signed and wars were declared, and the triumphant generals of the Roman army came here to give their thanks. Other titles of Jupiter include Caelestis (heavenly), Lucius (of the light), Totans (Thunderer), Fulgurator (of the lightning). As Jupiter Victor, he led the Roman army to victory. 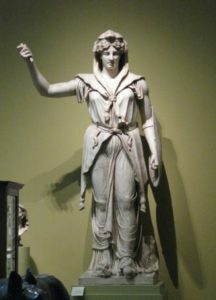 Jupiter is also the protector of the ancient league of Latin cities. His attribute is the lightning bolt and the eagle is both his symbol and his messenger. 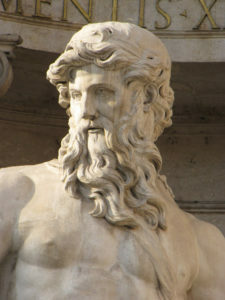 In art, Jupiter, the god of the Roman Pantheon was usually portrayed as bearded, middle-aged but with a youthful figure. He would look very regal and imposing. Artists always tried to reproduce the power of Jupiter in their work, usually by giving him a pose as he is about to throw his bolt of lightning. 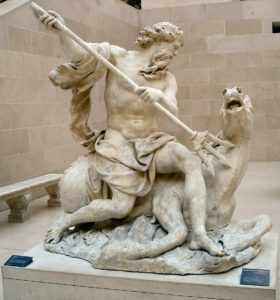 There are many statues of Jupiter and he is known for his power of using his guiding light to resolve all issues and is portrayed as a fatherly figure in most stories.